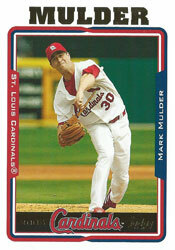 In the last classic pitchers duel at Busch Stadium, Mark Mulder gave the best performance of his Cardinals career, tossing 10 shutout innings and beating Roger Clemens and the Astros. On April 23, 2005, in the Cardinals’ final season at the ballpark that had been their home since 1966, Mulder pitched a masterpiece in a 1-0 St. Louis victory. Mulder, a left-hander, threw an efficient 101 pitches and faced 33 batters, three more than the minimum for 10 innings. He induced 17 ground outs. Each of the Astros’ five hits was a single. Clemens, 42, winner of seven Cy Young awards, was as good as expected, holding the Cardinals scoreless on four hits in seven innings before being relieved by Chad Qualls. Mulder, 27, making his fourth Cardinals start after coming to St. Louis from the Athletics in a December 2004 trade, was better. In a ballpark that had been the site of gems by Cardinals pitchers such as Bob Gibson, Steve Carlton, Bob Forsch, Joaquin Andujar and John Tudor, Mulder’s performance ranked among the best. It was the last 1-0 game played at Busch Stadium II. _ The first Cardinals starter to pitch an extra-inning shutout win since John Tudor did so on Sept. 11, 1985, in a 1-0 St. Louis victory over the Mets. _ The first Cardinals starter to go 10 innings since Jose DeLeon went 11 against the Reds in a 2-0 Cincinnati victory on Aug. 30, 1989. _ The first Cardinals starter to go 10 innings and win since Greg Mathews did so against the Mets in a 3-1 St. Louis victory on Aug. 16, 1986. _ The first major-league starter to pitch a 10-inning shutout win since Roy Halladay of the Blue Jays did so against the Tigers in a 1-0 Toronto victory on Sept. 6, 2003. In the fourth inning, Mulder escaped serious injury. Mike Lamb’s bat shattered when he hit a ground ball to second. The barrel of the bat struck Mulder on the ankle and he doubled over in pain. “It hit me right in a spot where it made my whole foot go numb,” Mulder said to MLB.com. Feeling quickly returned to the ankle, though, and Mulder was able to continue. Before sending Mulder to pitch the 10th, Cardinals manager Tony La Russa consulted with the pitcher. “He said he was OK to go,” La Russa said. After setting down the Astros in the top half of the extra inning, Mulder was scheduled to lead off the bottom of the 10th. La Russa sent Reggie Sanders to hit for Mulder against Qualls. Sanders produced an infield single. “It was a swinging bunt that feels just as good as a ringing line drive,” Sanders told the Associated Press. On a hit-and-run, David Eckstein grounded out, with Sanders advancing to second.